They’re surprising words considering Central City Brewers and Distillers’ prominence in the Canadian brewing industry. The business’ wildly popular beers and spirits have won dozens of international and national awards, and they can be found across Canada and the United States. Central City is also operating two bustling brew pubs in the hubs of the Lower Mainland, a brewery and a distillery. The BC business has also earned media attention for its annual Red Racer IPA for Autism Program. They’ve raised $250,000 since 2013, and plan to continue the fundraiser indefinitely. But Darryll started small. He acknowledges, “In my early days, socio-economically, my family and I were very challenged.” He went to catering school at 16-years old, and then started his world in the kitchen, as it was the fastest way for him to move up in the world. He’s unusually humble despite his considerable achievements and profits. In Darryll’s eyes, he still isn’t successful, nor does it compel him to keep growing. When wrapping up the interview, he acknowledges that his inspiration is different than most business people. “Fear is a hell of a motivator,” he confesses. Read on to learn how Darryll expanded his small business to be a major player in the billion-dollar brewing market, his take on work-life balance and how you can get free financing from the government. How can businesses get financing from the government like you did? There are so many opportunities to help businesses grow. So many programs and grants are offered by government to make sure that anyone who wants to be an entrepreneur or start a business can. They’re out there, so take advantage of them. We partnered with different levels of government, from municipal government to provincial government. We leveraged those financial facilities out there to maintain our growth curvature. On the municipal side, we asked for land and the financing. Surrey gave me five acres and $15.5 million to build my building. On the provincial side, we used a venture capital corporation to facilitate our growth through private equity. You have to get yourself in a position to be successful. So start by utilizing all those programs, because you’re going to need them to grow. What’s the best way to earn a loyal customer following? We’ve come to earn a tribe of followers. What we’re acutely aware of is that we have to be very consistent to maintain that tribe. We spend a lot of money, a lot of effort and a lot of energy into making sure we can consistently deliver. It’s like anything else – if you screw up, there are plenty of people out there who would love to take your place. 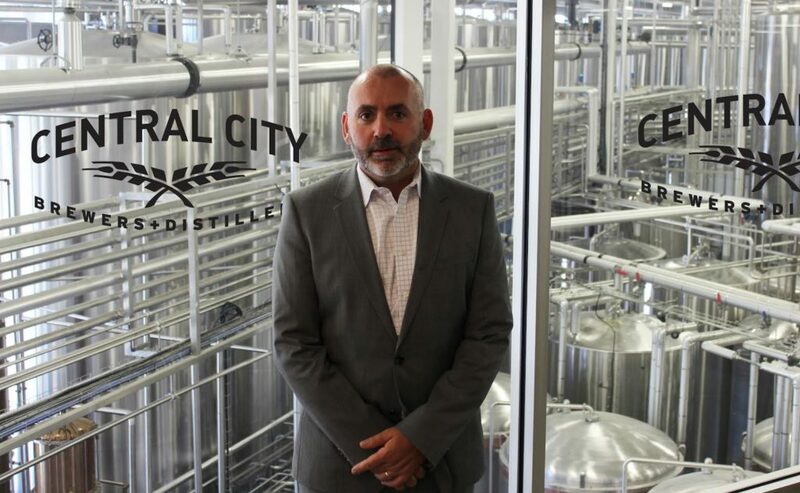 How does Central City stay ahead of the competition in your industry? Innovation. Our structure is completely unique in the market space. Every fiber of our business is constantly being reviewed and constantly being challenged. It has to be to maintain our position. We don’t necessarily look at BC or craft industry as our competitor. We look at ‘Big Beer’ as our competitor, and we look to Canada as our market, not BC. There’s a minute amount of companies that have a large percentage of the market. We want to chip away at them, and we do. We’re constantly growing, and as long as we’re growing, we’re okay. You have to build a five-year plan, but you constantly have to rethink the plan because time continues [to move forwards]. Do you think work-life balance is important? If you don’t have a balanced life, nothing is going to work. Entrepreneurs who go too strong into business invariably suffer at the backend with family and personal relationships. Far too many people burn out trying to make a business go. Their family erodes, and when their family erodes, their business erodes because no one is happy. Where did the Red Racer IPA for Autism Program come from? I have an autistic son who was born seven years ago, and at two and a half years old, he was diagnosed with pervasive development disorder not otherwise specified. So we stopped everything we were doing as a couple and focused on him. We learned about autism therapy through a community of parents. They gave us these gifts, and now it’s time to give back. We fund a university study at Simon Fraser University that disseminates information back to parents on the ground. The Red Racer IPA for Autism donates a percentage of its sales annually towards the Central City Autism Program.